Wood is a I–41 fibrous tissue found in many plants. It has been used for centuries ice noth fuel and as a construction material. It is composed of 2 natural composite of cellulose fibers (which are strong in tensio .) embedded in a matrix of lignin. Lignin resists compression. W md is produced as secondary xylem in the stems of trees. In a living tree it transfers water and nutrients to the leaves and other growing tissues. It has a support function, enabling woody plants to reach large sizes or to stand up for themselves. Wood is yielded by trees. 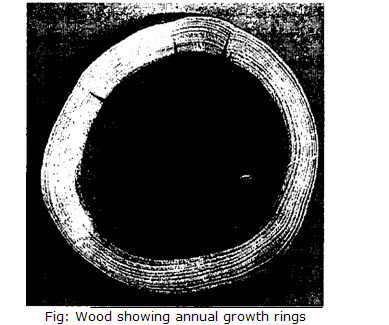 A tree increases in diameter by the formation of new woody layers between the existing wood and the inner bark. It envelops the entire stem, living branches, and roots. Technically this is known as secondary growth. Secondary growth takes place by the cell division in the vascular cambium, a lateral meristem, and subsequent expansion of the new cells. the center of the tree arc formed early in the growing season. Growth is rapid during these seasons. They are composed of wider elements. It is lighter in color than that near the outer portion of the ring. It is known 3S early wood or springwood. h) Late wood or summer wood; The outer portion formed later in the season is then known as fir: latewood or suminerwood. A knot is a particular type of imperfection in a piece of wood. It will affect the technical properties of the wood. It makes the wood imperfect. But knots may be exploited for artistic effect. In a longitudinally sawn plank, a knot will appear as a roughly circular solid piece of wood. The grains of the rest of the wood flow around this piece of wood. Within a knot, the direction of the wood (grain direction) is up to 90 degrees different from the grain direction of the re ular wood. a) Heart wood: Heartwood (or “xylem”) is wood that as a result of tylosis become more resistant to decay. Tylosis is the deposition of chemical substances (a genetically programmed process). Once heartwood formation is complete, the heartwood is dead. Some uncertainty still exists as to whether heartwood is truly dead, as it can still chemically react to decay organisms. Usually heartwood looks different; in that case it can be seen on a cross-section. Heartwood may (or may not) be much darker than living wood. It may (or may not) be sharply distinct from the sapwood. However, other processes, such as decay, can discolor wood, even in woody plants. The term heartwood derives from its position and not from any vital importance to the tree. A tree can thrive with its heart completely decayed. b) Sapwood: Sapwood is the younger, outermost wood. In the growing tree it is living wood. Its principal functions are to conduct water from the roots to the leaves. It also store up and give back aecording to the season the reserves prepared in the leaves. All xylem tracheids and vessels have lost their cytoplasm and the cells are therefore functionally dead in sapwood. All wood in a tree is first formed as sapwood. The more leaves a tree bears and the more vigorous its growth, the larger the volume of sapwood required. Hence trees making rapid growth in the open have thicker sapwood for their size than trees of the same species growing in dense forests. Sometimes trees grown in the open may become of considerable size, 30 cm or more in diameter, before the formation of heartwood. Some species begin to form heartwood very early in life. Therefore, they have only a thin layer of live sapwood. But in others the change comes slowly. Thin sapwood is characteristic of such species as chestnut, black locust, mulberry, osage-orange, and sassafras. But it is thick in maple, ash, hickory, hackberry, beech, and pine. Some others never form heartwood. There is a strong relationship between the properties of wood and the properties of the particular tree that yielded it. For every tree species there is a range of density for the wood it yields. There is a rough correlation between density of a wood and its strength (mechanical properties). For example, mahogany is a medium-dense hardwood. It is excellent for fine furniture crafting, making it useful for model building. The densest wood may be black ironwood. It is common to classify wood as either softwood or hardwood. a) The wood from conifers (e.g. pine) is called softwood. b) The wood from dicotyledons (usually broad-leaved trees, e.g. oak) is called hardwood. These names are a bit misleading, as hardwoods are not necessarily hard, and softwoods are not necessarily soft. The well-known balsa (a hardwood) is actually softer than any commercial softwood. Conversely, some softwood (e.g. yew) are harder than many hardwoods. Some species show a distinct difference between heartwood and sapwood. In these species, natural color of heartwood is darker than that of the sapwood. Very frequently the contrast is conspicuous. This is produced by deposition of chemical substances in the heartwood. A dramatic color difference does not mean a dramatic difference in the mechanical properties of heartwood and sapwood. Some experiments on very resin( us Longleaf Pine specimens indicate an increase in strength, due to the resin. It increases the strength when wood is dry. Such resin-sat irated heartwood is called fat lighter. Structures built of fat lighter are r Dt attacked by termites. But they are very flammable. Stumps of old ilngleaf pines are often dug and split into small pieces. These are sold as kindling for fires. Stumps thus dug may actually remain a century or more since being cut. Abnormal discoloration of wood often denotes a diseased condition, indicating unsoundness. The black check in western hemlock is the result of insect attacks. Wood is a heterogeneous, hygroscopic, cellular and anisotropic material. It is composed of cells. Theircell walls are composed of micro-fibrils of cellulose (40% — 50%) and hemicelluloses (15% — 25%) impregnated with lignin (15% — 30%). The cells are mostly of one kind, tracheids. They are much more uniform in structure than that of most hardwoods. There are no vessels (“pores”) in coniferous wood such as one sees so prominently in oak and ash. The structure of hardwoods is more complex. The water conducting capability is depends on vessels. In some cases (oak, chestnut, ash) vessels are quite large and distinct. But in others (buckeye, poplar, willow) it is too small to be seen without a hand lens. Such woods are divided into two large classes, ring-porous and diffuse-porous. b) Diffused porous woods: In this case, the pores are evenly sized. Therefore, water conducting capability is scattered throughout the growth ring instead of being collected in a band or row. Examples of this kind of wood are basswood, birch, buckeye, maple, poplar, and willow. Intermediate groups: Some species, such as walnut and cherry, are on the border between the two classes, forming an intermediate group. In temperate softwoods there often is a marked difference between latewood and early wood. The latewood will be denser than that .formed early in the season. When examined under a microscope the cells of dense latewood are very thick-walled. They have very small cell cavities. But those formed first in the season have thin walls and large cell cavities. The strength is in the walls, not the cavities. Thus there is greater the proportion of latewood the greater the density and strength. In choosing a piece of pine the principal thing to observe is the comparative amounts of early wood and latewood. The width of ring is not nearly so important as the proportion and nature of the latewood in the ring. the ring-porous hardwoods there seems to exist a pretty definite relation between the rate of growth of timber and its properties. Generally, if there is more rapid growth or the wider the rings of growth, the heavier, harder, stronger, and stiffer the wood. This, it must be remembered, applies only to ring-porous woods such as oak, ash, hickory, and others of the same group, and is, of course, subject to some exceptions and limitations. diffuse-porous woods, the demarcation between rings is not always so clear. In some cases, it is almost (if not entirely) invisible to the unaided eye. Conversely, when there is a clear demarcation there may not be a noticeable difference in structure within the growth ring. In diffuse-porous woods, the vessels or pores are even-sized, so that the water conducting capability is scattered throughout the ring instead of collected in the early wood. The effect of rate of growth is, therefore, not the same as in the ring-porous woods, approaching more nearly the conditions in the conifers. Some structural material roughly resembles ordinary, dicot or conifer wood. These are produced by a number of monocot plants. These also are called wood. Its example is bamboo. It is a member of the grass family. It has considerable economic importance. Large culms are widely used as a building and construction material. Another major plant group is called wood are the palms. Of much less importance are plants such as Pandanus, Dracaena and Cordyline. With all this material, the structure and composition of the structural material is quite different from ordinary wood. In the protoplasmic contents of the cells. As free water in the cell cavities and spaces. In heartwood it occurs only in the First and last forms. Wood that is thoroughly air-dried retains from 8-16% of water in the cell walls. The oven-dried wood also retains a small percentage of moisture. The water contents make the wood softer and more pliable. A similar effect is in the softening action of water on paper or cloth. Within certain limits, the greater the water content, the greater its softening effect. 1. Fuel: Wood has a long history of being used as fuel. It is stills used as fuel in rural areas of the world. Hardwood is preferred er softwood because it creates less smoke and burns longer. Construction: Many buildings are made and decorated with wood. Wood is an important construction material. Wood remains in common use today in boat construction. Wood to be used for construction work is commonly known as lumber in North America. Elsewhere, lumber is called as felled trees. New domestic housing in many parts of the world today is commonly made from timber-framed construction. Engineered wood products are becoming a bigger part of the construction industry. They may be used in both residential and commercial buildings as structural and aesthetic materials. In buildings made of other materials, wood will still be found as a supporting material. It is especially used in roof construction, in interior doors and their frames, and as exterior cladding. Wood is also commonly used as shuttering material. Engineered wood: Wood used in construction includes products such as glued laminated timber (glulam), laminated veneer lumber (LVL), parallam and I-joists. These products allow the use of smaller pieces. They may also be selected for specific projects such as public swimming pools or ice rinks Wood will not deteriorate in the presence of certain chemicals. These engineered wood products are more environmentally friendly. They are sometimes cheaper, than building materials such as steel or concrete.- Wood unsuitable for construction is broken down mechanically (into fibers or chips) or chemically (into cellulose). It is used as a raw material for other building materials such as chipboard, engineered wood, hardboard, medium-density fiberboard(MDF), oriented strand board (OSB). Such wood derivatives are widely used. Wood fibers are an important component of most paper. Cellulose is used as a component of some synthetic materials. Wood derivatives can also be used for kinds of flooring, for example laminate flooring. Next generation wood products: Further developments include new lignin glue applications, recyclable food packaging, rubber tire replacement applications, anti-bacterial medical agents, and high strength fabrics or composites. As scientists and engineers further learn and develop new techniques to extract various components from wood. Furniture and utensils: Wood has always been used extensively for furniture, including chairs and beds. Also for tool handles and cutlery, such as chopsticks, toothpicks, and other utensils, like the wooden spoon. In the arts: Wood has long been used as an artistic medium. It has been used to make sculptures and carvings for millennia. Examples include the totem poles carved by North American indigenous people from conifer trunks. Certain types of musical instruments, such as those of the violin family, the guitar, the clarinet and recorder, the xylophone, and the marimba, are made mostly or entirely of wood. Medicine: In January 2010 Italian scientists announced that wood could be used to become a bone substitute. It is likely to take at least five years.